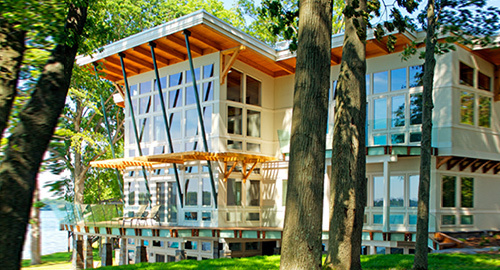 Upon completion a fiber artist, her husband and their two college-aged sons will have created a 2,400 square foot vacation getaway and fiber arts studio on a steeply sloping site in the Critical Dunes along the shores of Lake Michigan in Saugatuck, Michigan. Metal Architecture, an industry leading publication, bestowed their President's Award on us for this forward looking deisgn in an AIA juried competition. 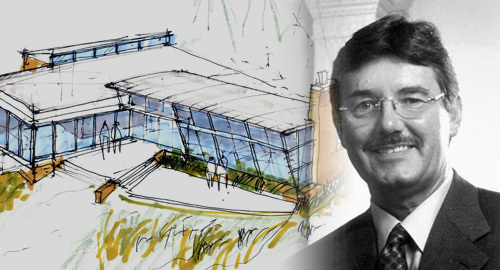 For over 30 years, John Allegretti has been principal architect for over five-hundred projects across the United States and Internationally. 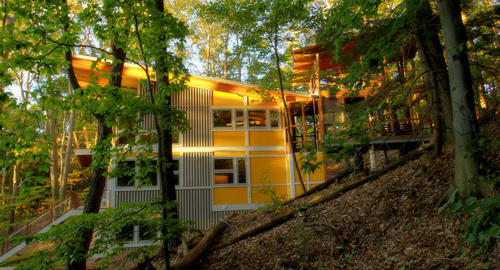 Our practice promotes professional excellence of affordable & sustainable residential designs. Seeking the collective dream of a multigenerational family, this universally designed home responds to the similarities and differences inherent between generations. The Owners wanted to minimize the stylistic baggage which consumes most “cottage” residences, and with Allegretti Architects created a home with simple lines focused on the view and the natural environment. Sustainable energy requirements on a budget directed the design decisions regarding the SIPs panel insulation, energy systems, roof shading, other insulation systems, lighting and detailing. Easily constructed and linear, the home harkens back to mid century modern pavilions with present day environmental sensitivities and harmony with the site. 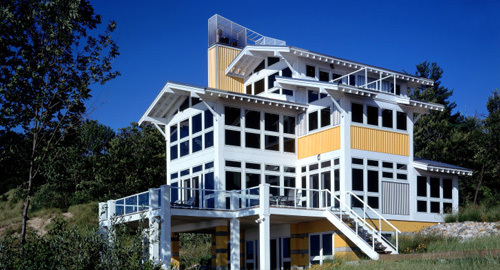 This six bedroom vacation residence along the shore of Lake Michigan is slated to begin construction in 2013 and completed in the following year. It will be primarily a stone-clad finish with expanses of thermally insulated and shaded glass. Floors include a full basement, two full levels and a loft. Balconies from the upper levels overlook the lake, and a stone patio opens up to the views. On the interior, interchangeable light rails allow for a variety of art displays, and stacked fireplaces flank the open main floor. Undulating wood trellis ceiling elements mirror the waves of the lake, as well as accommodate custom light fixtures. Other amenities include a four car garage, a wine cellar, a gymnasium, a billiard room and a yoga studio. Allegretti Architects is an architectural and planning firm founded on the principals of service, sustainability and excellence, love of the natural environment and people shepherd our firm. We see our mission as architects and planners as a social responsibility and strive to bring best environmental practices and client responsive solutions into harmony in each project. A passion for quality driven decisions are reflected in our architectural solutions.